We've had SUNSHINE this past week. I've felt like skipping every day :) Sadly, I've been working too much and it was dicey getting some pictures in this week. I'm joining Tootsie over at Fertilizer Friday to celebrate what's blooming this week. I have a new addition to my side garden. A pretty new Rhododendron to take the place of my hydrangea that kicked the bucket this winter. The snowball tree is beginning to bud. I love the light green tint the blossoms have as they begin to sprout. 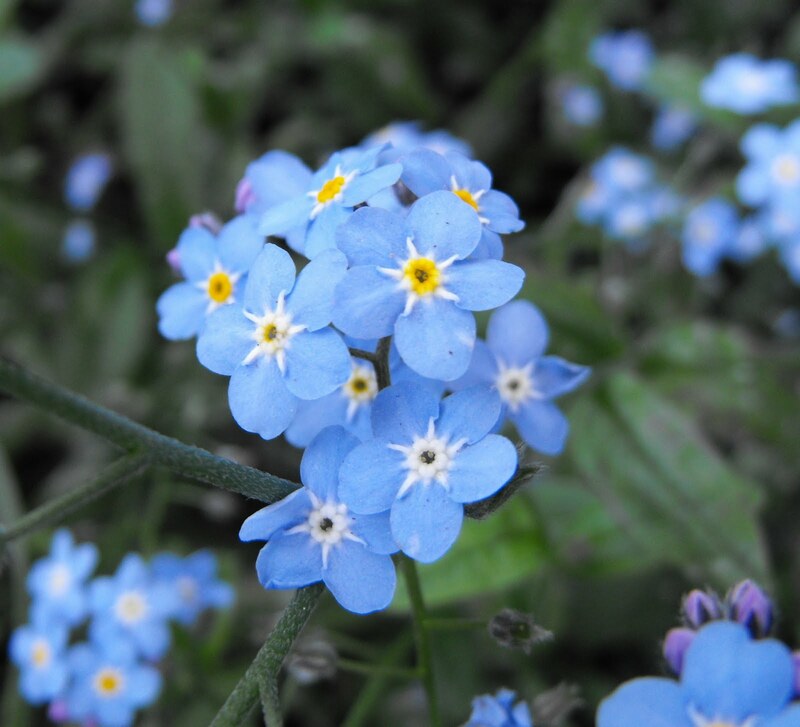 Forget Me Nots continue to freshen up my shade gardens with blue cheer. For the past few years, this has been my favorite spring flower. I started my Forget Me Nots by seed 5 years ago. 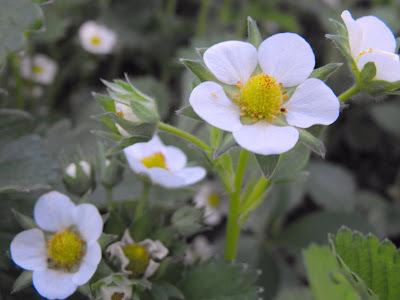 The strawberries are finally in full bloom. They are about 3 weeks behind. Crossing my fingers that we'll have a few berries by late June because my little boy will be having a birthday party and he loves Mommas cake with strawberries! My container pots have been pretty slow growing with all of our rain and cold weather, but some of the little petunia's have popped out. 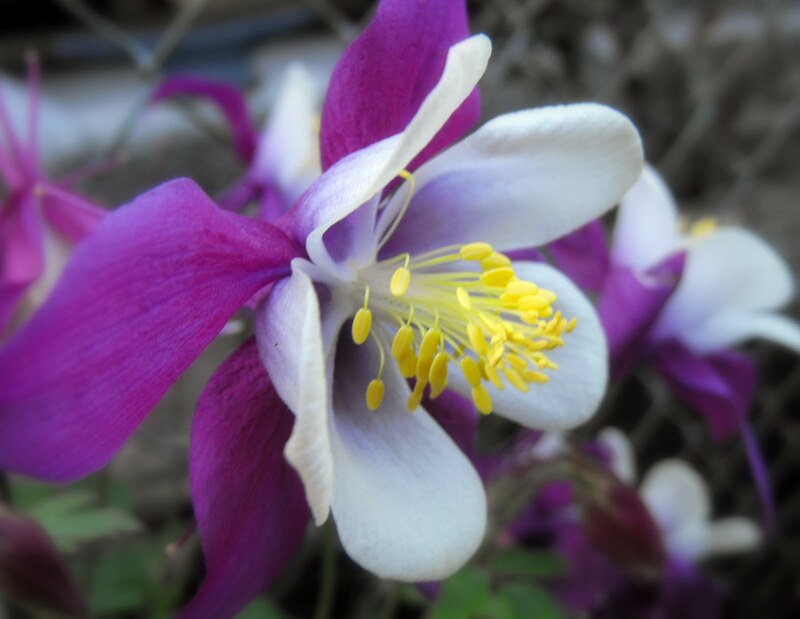 And lastly, my pretty Columbine, in my new garden bed. 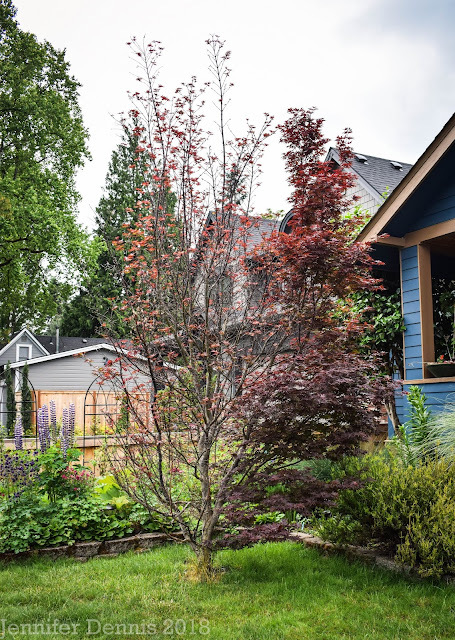 **I just found out this information from A Southern Garden by Becca, but a special fellow Pacific NW blogger, Linda @ Gardening By Trial and Error, has passed away from cancer. Please stop by Becca's blog for information. I will greatly miss Linda. It seems like your garden is way ahead of mine. It looks beautiful. 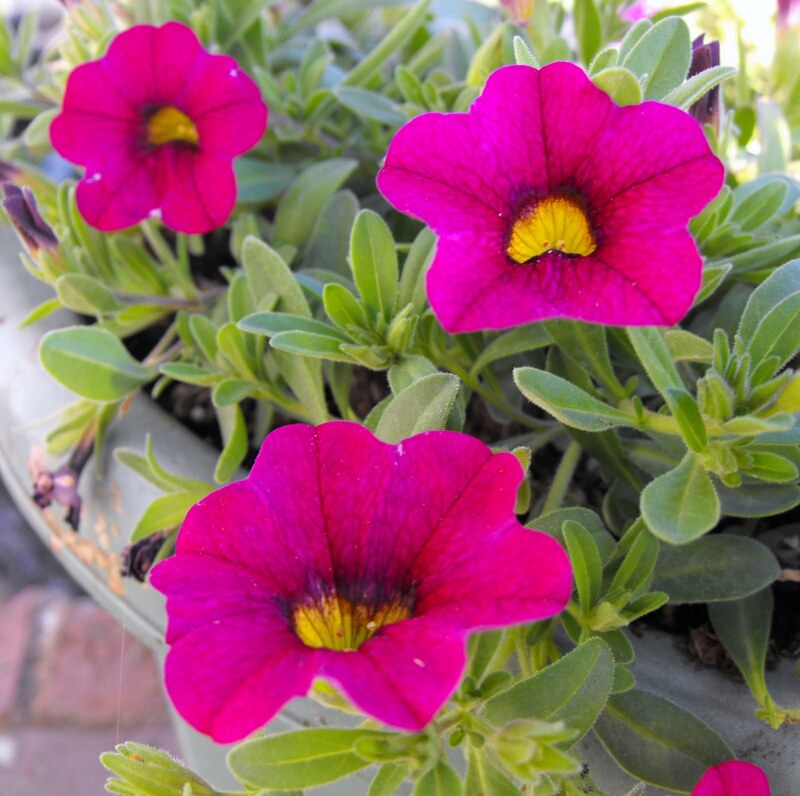 Glad you are able to be out in the sunshine among your wonderful blooms. 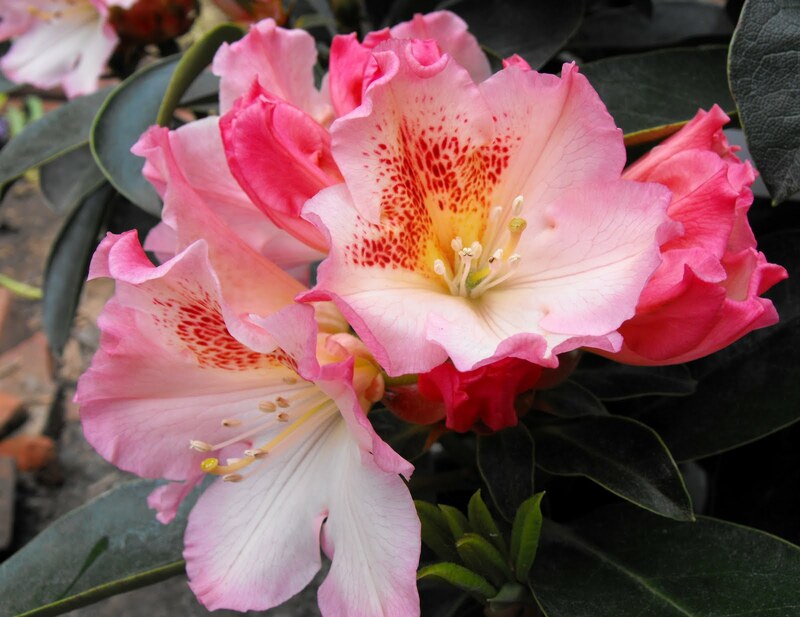 I love that rhodie of yours, such a gorgeous combo of colors. Hi Jenni, everything is looking just gorgeous in your garden. That last one (I can never spell it!) is just stunning. I'm going to look for some of those. How is your blog linked to Tooties' blog, or is that the idea of the Fertilyzer Friday? Ok, Jenni...I get it now. I didn't look down far enough on her post. Such fun. I joined the GBBD one on the 15th and got to know quite a few great blogs through that....so I will join in this one too. I have a couple of things out today! Love your new Rhodie. Stunning. Such beautiful blossoms! I love the color of your rhodie! I hope the sunshine stays around for a while. It's finally popped out here today! thank you for stopping by and leaving a note on my garden gate. 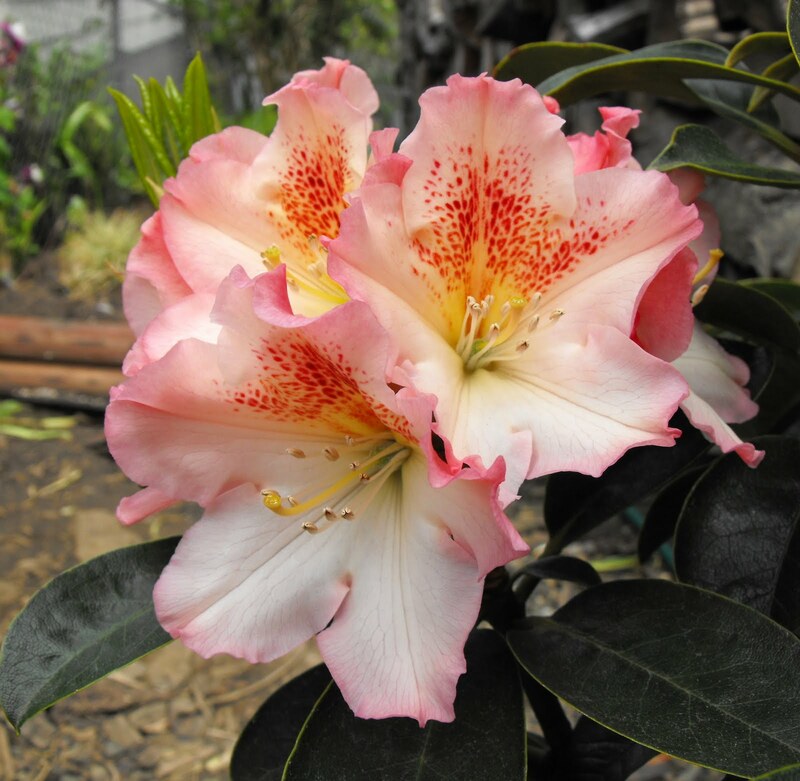 Gorgeous rhodie! Love your snowball. My Mom always had one in front of the kitchen window, yours brought back memories. Don't you love the way forget me nots reseed themselves?! The only thing to say is: beautiful! beautiful and beautiful. I'm curious about the columbine. I'd like to get one but I hear they need morning sun only. Tricky for placement. Where do you have yours? Thanks. Beautiful rhodie. Thanks for posting the info about Linda. You have such beautiful flowers and I really enjoyed my visit. That is so sad though about your friend. My prayers are with them. Doesn't it feel great when that sun makes an appearance after a long abscence? We're back to beautiful sunny days once more and it's just glorious. Absolutely love that new Rhodo. It's just gorgeous. All your flowers are looking lovely. Oh how I wish I could grow Aquilegias. That is a stunning little bloom. Hasn't the weather been great! We spent the morning with my daughter's preschool class at a farm planting pumpkin seeds. 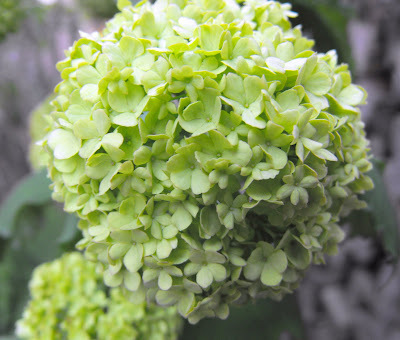 My Snowball bush is at the same stage as yours, I think I like the flowers a the green stage best. Hope you get to enjoy some sun this weekend, at least as long as it lasts. Hi Jenni~~ Catherine has a poignant tribute to Linda on her blog. ... Love your spring bloomers. I know what you mean about the plants being behind. I was wondering if my strawberries were ever going to bloom. Have a great weekend. I do have my columbines in a partly sunny area. I think in their natural setting you'd find them in woodland settings w/interspersed sunlight and protected by the hot, afternoon sun. Mine do get some afternoon sun though, but are near larger, taller plants and buildings to provide shade. Thanks for stopping by! That's a beautiful rhododendron - does it grow very big? I am so sorry to hear about Linda@Gardening By Trial and Error. We had connected as part of the worldwide fellowship of Lindas. Your forget-me-nots are lovely, but I have mixed feelings about them. They are the main weed at my allotment. A pretty weed, but certainly 'a plant in the wrong place'! As I write the rain is lashing down and it's blowing a gale. We have got your weather! Hey Linda..sorta sorry to hear about your weather ;) I can see where forget me nots in the allotment would be a problem. 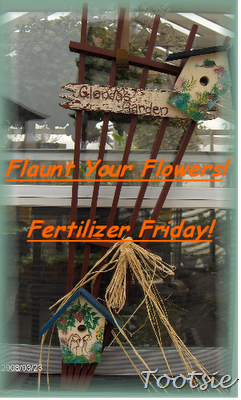 Looking forward to hearing more about your plot!